Editor&apos;s note: This post was updated Feb. 3, 2016, at 12:25 pm to include a statement from the Food and Drug Administration and a comment from Mark Sauer. Would it be ethical for scientists to try to create babies that have genetic material from three different people? An influential panel of experts has concluded the answer could be yes. The 12-member panel, assembled by the National Academies of Sciences, Engineering and Medicine, released a 164-page report Wednesday outlining a plan for how scientists could ethically pursue the controversial research. "The committee concludes that it is ethically permissible" to conduct such experiments, the report says, but then goes on to detail a long list of conditions that would have to be met first. For example, scientists would have to perform extensive preliminary research in the laboratory and with animals to try to make sure it is safe. And then researchers should initially try to make only male babies, because they would be incapable of passing their unusual amalgamation of DNA on to future generations. "Minimizing risk to future children should be of highest priority," the committee writes. The report was requested by the Food and Drug Administration in response to applications by two groups of scientists in New York and Oregon to conduct the experiments. Their goal is to help women have healthy babies even though they come from families plagued by genetic disorders. A statement issued by the FDA immediately after the report&apos;s release raised questions about whether the FDA would permit the research to move forward. The FDA email praised the "thoughtful work" of the panel and said the agency would be "reviewing" the recommendations. But it noted that the latest federal budget "prevents the FDA from using funds to review applications in which a human embryo is intentionally created or modified to include" changes that could be passed down to future generations. As a result, the email says, any such research "cannot be performed in the United States" at this time. The researchers pursuing these experiments welcomed the panel&apos;s conclusions. Sauer called the report more of a "yellow light" than a "green light," because of the long list of caveats and cautions. But that is "better than a red light," he says. "Most importantly to us is that it allows the work to continue to hopefully produce children without these disorders," Sauer says. But Sauer said he was disappointed when he learned of the FDA&apos;s response. "Politics as usual often gets in way of progress," Sauer said in a subsequent email. While the FDA statement would cause "undue delays" in his research, he added that he hoped it wouldn&apos;t permanently "necessarily halt the efforts." Critics of the research, meanwhile, say the number of women who could benefit from the experiments is so small that it&apos;s not worth crossing a line that&apos;s long been considered off-limits — making genetic changes that could be passed down for generations. "The possibility of what you could call &apos;mission creep&apos; is very real," says Marcy Darnovsky, executive director of the Center for Genetics and Society, a watchdog group based in Berkeley, Calif. "People are talking about going forward not just with this but with the kind of genetic engineering that will produce outright genetically modified human beings." Once that happens, Darnovsky says, "I think you get into a situation of where some people are genetically enhanced and other people are the regular old variety of human being. And I don&apos;t think that&apos;s a world we want to live in." The goal of the research is to help women carrying diseases known as mitochondrial disorders, which are only passed down by women through defects in the genetic material in their eggs. Specifically, the defects are in a type of genetic material known as mitochondrial DNA. Unlike the DNA that most people are familiar with — the 23 pairs of human chromosomes that program most of our body processes and traits — mitochondrial DNA consists of just 37 genes inside mitochondria, which are structures inside cells that provide their energy. Mitochondrial disorders range from mild to severe. In many cases there is no treatment, and the affected child dies early in life after suffering progressive, debilitating symptoms. Scientists want to create eggs free of mitochondrial defects by removing the defective mitochondrial DNA. It would be replaced with healthy mitochondrial DNA from eggs donated by other women. The British government recently approved such experiments in that country. But this remains controversial, not only due to the fact that the resulting children would have DNA from three people. 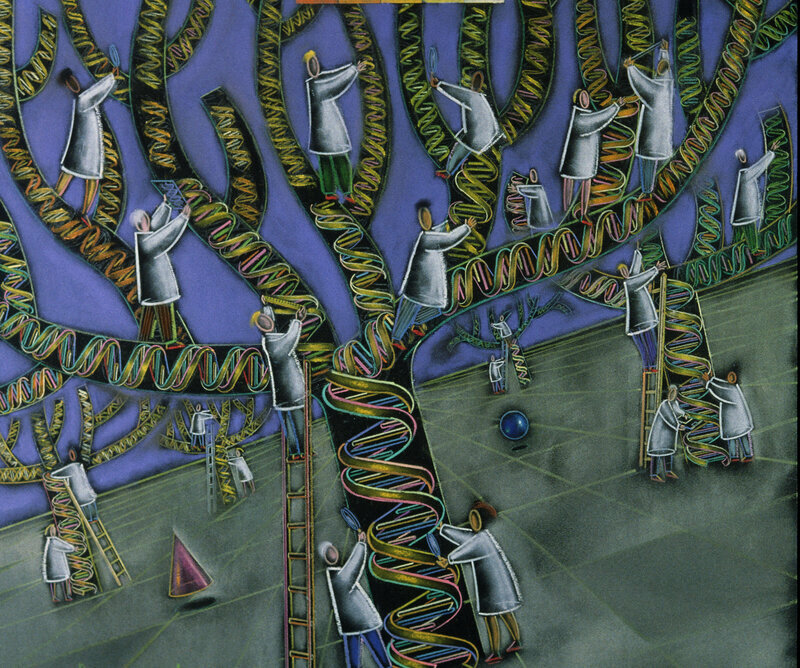 Because the transplanted DNA could be passed down for generations, critics fear it could accidentally introduce errors into the human gene pool that could create new diseases. They also worry it would set a precedent that could open the door to creating designer babies, in which parents can pick and chose the traits of their children. Because of such concerns, making any change in DNA that could be passed down for generations has long been considered off-limits. The committee report acknowledged that making babies with DNA from three different people could have "psychological and social effects" on the offspring, including issues about their "conception of identity." In addition, the committee acknowledged the possibility that it could lead to attempts at genetic "enhancements." Such work would raise thorny regulatory issues, the committee noted. For example, the federal government is prohibited from funding research that involves destroying human embryos. As a result, "even an agency request" for data from such research in support of FDA approval "could well be controversial," the report says. Nevertheless, the committee says the potential benefits make the work worth pursuing with careful oversight. Moreover, the FDA could at some point even consider letting experiments proceed to try to create female babies if certain criteria are met, the report said, including the production of "clear evidence of safety and efficacy from male" experiments and signs that it would be publicly acceptable.